Make others feel your presence by sending this Gorgeous Arrangement of 150 Dutch Roses in Red and let them feel very delighted. 150 Red Dutch Roses Arrangement with 500 grms Assorted Sweets. 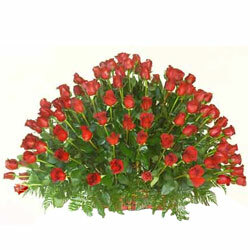 150 Red Dutch Roses Arrangement with 16 pcs Ferrero Rocher chocolate box.